Should I Refinance when Mortgage Rates are currently the Lowest in 2017? Should I refinance while mortgage rates are low during 2017. NSH Mortgage has the knowledge and tools to help you fiqure out your options in 2017. Current mortgage rates are holding low. If you missed your chance to refinance your home last year but, it may not be too late to secure a world class mortgage rate. Dropping your rate by just 1.0%, from 5.25% to 4.25%, puts ten percent of your mortgage payment back into your pocket each month. That means for every $1,000 you pay to your lender today, thus you could reduce your payment by $100. That is $12,000 saved over the next ten years simply by doing a refinance. Additionally, there are still millions of homeowners eligible for a refinance, and you may be one of them. Homeowners Holding Loans For Too Long? The mortgage rates are currently hovering near 4.25%. You would think homeowners would be rushing to refinance their homes. Since, low mortgage rates and lower monthly payments help secure a better financial future. Yet, most of the refinance eligible households are currently doing nothing, and thus they are losing the opportunity to benefit from these low rates. The government for one is perplexed especially because its Home Affordable Refinance Program (HARP) is in its last year and volume on the program has dropped to an all time low. To spur interest in HARP and to help consumers understand that HARP is not a scam, the program’s sponsoring agency has been hosting town halls with underwater homeowners nationwide. It even goes so far as to list the number of eligible homes by county but, it is not just HARP eligible homeowners who are eschewing the opportunity to refinance. Homeowners with all types of home loans are doing the same and with no promises that mortgage rates will stay this low.Yet, they believe it is not worth it to check up on their current rates to see what they are eligible for which is wrong. When mortgage rates drop homeowners typically wonder “Should I refinance my mortgage?” Low mortgage rates are enticing but, homeowners balance the want for a lower rate with the question of is this even worth it? They worry about things other than low mortgage rates by how they felt the last time when they applied for a mortgage, or things they would have heard from friends or family about the process. It is understandable to avoid refinancing because of the stress it may add to your life but, what if that stress is misplaced. The mortgages of 2008 to 2012 are very different from the mortgages of 2017. Since, getting approved for a mortgage is simpler and faster than it used to be. Then there is the question of does it make financial sense to refinance. On this topic it is best to avoid the common knowledge because the most common arguments consumers make against refinancing can be rather misleading. Perhaps you have heard these two arguments. 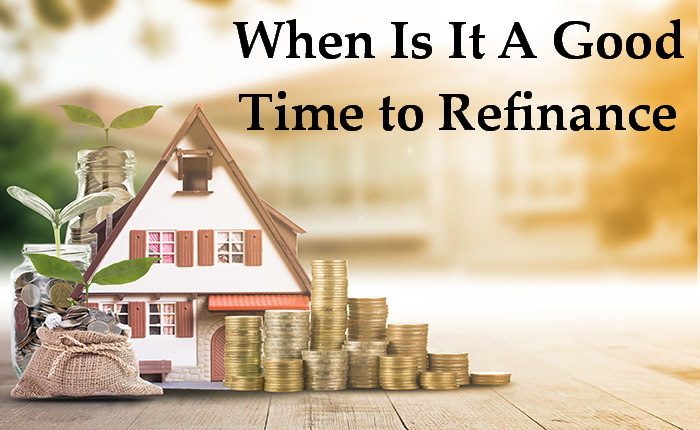 The first argument against refinancing is that it does not make sense to refinance unless you are lowering your mortgage rate by one percentage point or more. The second states that it does not make sense to refinance if you are going to move before your loans hit its break even point. The “Saving One Percent” argument is a holdover from the 1950s when closing costs were big and loan sizes were small yet, homeowners lived in their homes until their deaths. Back then when loan sizes were typically less than $60,000, and homeowners had to lower their mortgage rates at least by one percent to save $1,000 annually. Yet, the current loan sizes are typically about refinancing so that homeowner can save six times this amount. Even a modest mortgage rate reduction can result in substantial monthly savings. So long as costs are held low even by a quarter of a percentage point reduction can be worthwhile. Also you do not need to save just one percent to have a refinance make sense and only have to just save money. Another reason homeowners pass on a refinance is because they think they will never recoup their losses. They rely on a vaguely mathematical approach that is known as the Break Even Method which it turns out to be just as flawed as the 1% Fallacy. These assumptions carry weight on the mind of homeowners. Of course you may want to refinance your home sometime in the future. There is a lot of reasons why you might. Maybe mortgage rates have dropped again or maybe you would like to take cash out for a home improvement project, or even to diversify your assets. Additionally, 15 year mortgage rates are extremely low but, what if you wanted to reduce your long term interest payments because 15 year mortgages pay, 65% less mortgage interest over time. Now before you say mortgage rates will never go lower. Just remember that people have been saying that since 2009 and every year they have been wrong. They were even saying it back in March of 2017 and they were still wrong. People are notoriously terrible at predicting the future of mortgage rates. Mortgage rates can go lower, Wall Street is unpredictable and furthermore your financial situation could change so that makes it more unpredictable. Therefore Break Even Method fails to work and you cannot possibly know for certain how long you will hold your refinanced loan. Which means you cannot really determine your exact break even point. There is a better way to know whether it is time to refinance. Since, it gets better than the One Percent Method and better than the Break Even Method. Can you save money and pay nothing to do it. Yes, you can by using the zero closing cost mortgage. Zero closing cost mortgages are precisely what their name implies, they are mortgages for which there are literally no closing costs. When there are no closing costs there are no break even points to consider, and no one point savings to monitor. When you can lower your mortgage rate and pay nothing to do it that is when you should refinance. The good news is that no closing cost mortgages are readily available across all loan types including FHA loans, VA loans, and conforming mortgages. In general, for loan sizes of $250,000 or more, you can get a zero closing cost mortgage by increasing your mortgage note rate 25 basis points (0.25%) and for loan sizes over $400,000, the typical increase is by 12.5 basis points (0.125%). The extra bump to your mortgage rate creates more value to the lender. The lender then uses this extra value to pay your loans closing costs on your behalf. It is a win-win situation, and you have paid nothing to get your refinance completed.